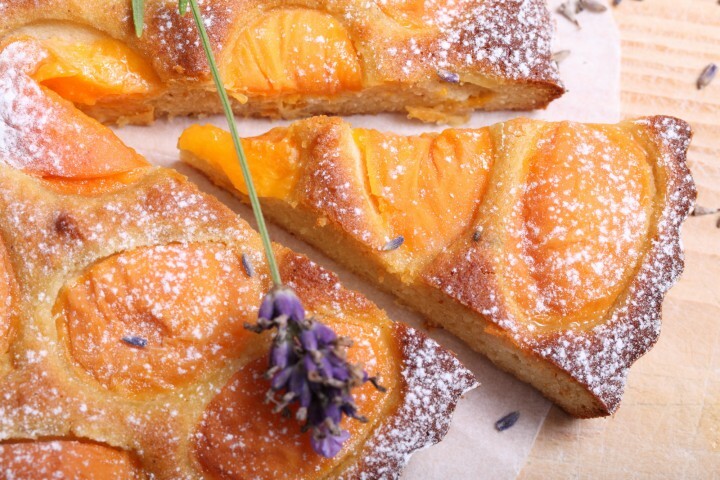 Apricots, lavender and honey, a perfect marriage! This recipe is very close to my heart. I have been making it in various shapes and sizes for some years now. It is a classic combination of ingredients that make you long for the Provence. Dreaming about plucking the ripe apricots from your own garden, collecting lavender from the purple fields. The recipe is really very simple and straightforward, combining, pouring and baking basically. You can make it your own by varying the amount of lavender, making it with melted butter or beurre noisette, using different types of honey (lavender would be obvious, but outside the Provence it is hard to get) or even using different fresh fruits. This recipe provides the perfect amount for 6 to 8 people. Especially when you serve it with cream or ice cream on the side. You can bake a double batch of course, but I would always recommend making the right amount for the party because this tart also is best eaten while fresh. Preheat your oven at 175 ºC / 350 ºF, conventional setting. Prepare a 20 cm / 7.8 inches shallow tart pan by brushing it with butter and giving it a coating of icing sugar. Start by melting the butter or making a beurre noisette (browned butter with lovely nutty taste). Set aside and leave to cool. In a bowl combine the almond flour, honey, egg, pinch of salt and dried lavender flowers. Then add the melted or brown butter and whisk until smooth. Pour this mixture in your mold and spread evenly. Press the apricot quarters in the mixture, arrange them the way you like best. Bake in the oven for about 35 minutes. Keep an eye on the crust and make sure it does not brown too fast, otherwise turn the oven down to about 160 ºC / 320 ºF from the point of perfect crust color. Take from the oven and leave to cool and firm up slightly before releasing it. Leave to cool completely, dust with icing sugar and serve. I baked this in an 8″ spring form. I quartered 4 apricots. The filling wasn’t deep enough to imbed the fruit so it stood proud before and after baking. The edged browned well before the center, I lowered the temp to 325 and baked it another 12 minutes to make the center firm up. It never did brown. I’m confident I had the ingredients and portions correct. The spring form and the height compared to the height of the pie, probably kept it from browning. Try an open pie dish and maybe the place in the oven, closer to the heat, would make a difference. It could also be your oven is a little bit different from ours and it would also make a difference to bake at 180C for example. Thanks so much for sharing your wonderful baking tips and recipes. This evening after dinner I decided to make this delicious tart with the Mirabelle plums falling from the tree in our garden. The harvest of Mirabelles has been processed into jam and preserved on white wine sirop, the ones which are too high up in the tree to reach are now falling down and some were used to fill this tart instead of apricots. This tart is a winner! So quick to make, I ground whole almonds in the food processor, left out the lavender, but added a few drops of bitter almond extract bought in France to bring out the almond flavour. Delicious! Thank you for sharing. This sounds a bit like a fairytale 🙂 Ripe fruit in abundance ready to be plucked or already falling from the heavy branches. You are very lucky to have this in your own garden. We love mirabelles and we have never made this tart with them but can imagine it being just perfect, also with the added bitter almond extract which fills your kitchen with the scents of a French patisserie. Thank you for sharing too and have a great (baking) weekend! Hello, what do you think substituting 1/4 to 1/3 apple sauce for butter? Would it make the tart not crunchy? But i plan to cut the sugar by a lot, so the crust will be v dry, makes using peaches a good option. Still i am thinking the possibility of appplesauce. We do not know exactly your reasons for wanting the change the recipe (calories we guess, if you use apple sauce without added sugar) and we cannot really help you with an answer because we have never tried substituting apple sauce for butter. But we know from reading about it it works well in cakes. If you also use a lot less honey the result will be indeed very different from the original, especially with the apricots, which are tart, so peaches is a good alternative there. The only way to find out would be baking it the way you have planned it. Good luck with the project and happy baking! What is the texture of the cake/tart? Is it like shortbread, pound cake, or ? This could help me figure out if I should add applesauce, which contains moisture that will certainly make the output cakey. The structure is (as you can maybe judge from the last picture) more cake-like but not the same as cake and certainly not like shortbread. Moisture-wise I think you will be OK.
Hi, I have a question. Do you guys think that I can substitute apricots with peaches? I am worried that it would make too much water and compromise the entire croute. Thanks for your advice in advance. Only one way to find out (we have not made this with peaches, but we did with plums and that was great too)….I think it will be OK to use peaches, but I would suggest using peaches that are not too ripe. A little bit of extra moisture is no problem, it will be absorbed by the batter and may even become better this way. Happy croute baking and a great weekend!